As a Cardinals rookie in 1962, first baseman Fred Whitfield was one of the best power-hitting prospects the franchise had produced in years. “He has a quicker bat than anyone on the Cardinals and he can reach the roof at Busch Stadium,” coach Vern Benson told The Sporting News. The Sporting News hailed Whitfield as the Cardinals’ “biggest surprise of 1962” and Whitfield was selected by big-league managers, coaches and players as the first baseman on the 1962 Topps all-star rookie team. Signed by Cardinals scout Mercer Harris, Whitfield was a standout in the minor leagues. He hit .309 with 23 home runs for Keokuk in 1958; .285 with 28 homers for Winston-Salem and Tulsa in 1959; .310 with 22 homers for Tulsa in 1960; and .301 with 18 homers for Charleston in 1961. He was batting .323 and leading the International League in home runs (eight) and RBI (28) when he was promoted to the Cardinals on May 26, 1962. The Cardinals were seeking a right-handed batter to replace injured outfielder Minnie Minoso. Because of a weak throwing arm after he hurt his shoulder as an American Legion pitcher, Whitfield only could play first base. Unlike Minoso, he batted left-handed. According to The Sporting News, it was Cardinals business manager Art Routzong who convinced general manager Bing Devine and manager Johnny Keane to promote Whitfield. In his first five pinch-hit appearances for the Cardinals, Whitfield produced three hits and a walk. 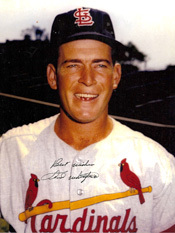 Whitfield finished the 1962 season with a .266 batting average, eight home runs and 34 RBI in 158 at-bats for the Cardinals. He hit .333 as a pinch-hitter and .412 with two outs and runners in scoring position. He was especially effective versus the Phillies, batting .313 with 13 RBI in 12 games. “Fred did an exceptionally good job, especially as a pinch-hitter and part-time player, jobs usually handled by older, experienced men,” Devine said. However, Whitfield became expendable because White, who batted left-handed, was entrenched at first base, and the Cardinals needed pitching. On Dec. 15, 1962, the Cardinals dealt Whitfield to the Indians for pitcher Ron Taylor and infielder Jack Kubiszyn. Whitfield hit 20 or more home runs three times for the Indians (21 in 1963, 26 in 1965 and 27 in 1966). In a nine-year major-league career (1962-70), he played for the Cardinals, Indians, Reds and Expos, batting .253 with 108 home runs.